Passing the Missouri written exam has never been easier. It's like having the answers before you take the test. Each year, hundreds of people will die in a Missouri car crash involving a teenage driver. Statistics such as this have prompted the state of Missouri to implement a Graduated Driver Licensing (GDL) program that sets milestones for teens to achieve prior to obtaining an unrestricted driver's license. The first milestone on your path to a Missouri driver's license is obtaining your instruction permit, which is known in other states as a learner's permit. Below you will find all the required steps, including documents to submit and info about your written permit test. You can also reach the Missouri Department of Revenue (DOR) at (573) 526-2407. Surrendering your valid current learner's permit. If your permit has expired, it may NOT be expired for more than 184 days. Birth date and birth place. As long as your learner's permit is valid or falls within the expiration range, the written exam will be waived. Otherwise, you'll need to test for your permit again. Date and place of birth (e.g. birth certificate, U.S. passport, Certificate of Citizenship). Social Security number (e.g. Social Security card, letter from SSA explaining the status of your SSN). Residential address (e.g. utility bill, pay check, bank statement). Have your parent/guardian sign a permission statement. Pass a road sign recognition exam. Pass the written permit test (see below). Pay the $3.50 permit fee. For more information about these required docs, please refer to this list provided by the DOR. To get your learner's permit, you'll need to pass both a road signs recognition test and a written permit exam. The MO written permit exam is based on information about Missouri traffic laws, road signs, and safe driving techniques. Most of the questions are sourced directly from the Missouri Driver Guide. 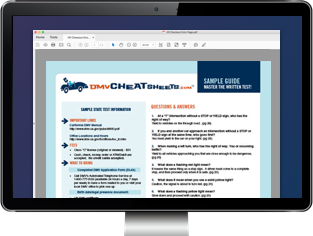 Although studying the driver guide is an excellent suggestion, we recommend preparing with an industry-leading online practice test that are provided by our certified partners. Don't risk the embarrassment or failing! Once you have your learner's permit, you're allowed to practice driving; however, there are some age-related restrictions you must follow. Additionally, all learner's permit holders must have it in their possession at all times, and all occupants of the vehicle must wear seatbelts. If you're under 16 years old, you can only drive when accompanied by a “qualified person" in the front seat next to you. Has been licensed for at least 3 years. Has received written permission from your parent or legal guardian. Licensed driver designated by a disabled parent or guardian. If you're 16 years old or older, you may drive only when accompanied by a person at least 21 years old with a valid driver's license seated in the front seat next to you. 10 hours of night driving as part of the overall 40 hours. If your current learner's permit expires or has been lost or stolen, visit your nearest DOR office and present your documents of identification that you used when you initially applied. You'll need to re-pay the permit fee of $3.50. Completed your behind-the-wheel driving hours. Held your learner's permit for at least 182 days. For more information, visit our MO Teen Driver's License page.